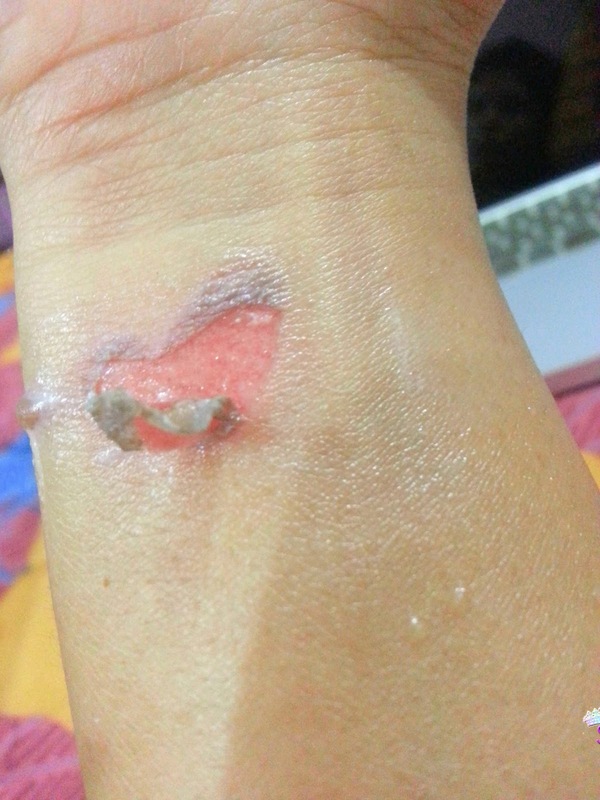 Today is the 4th Day since this Burn Injury Happened with me on Sunday The Morning Of Holi festival . 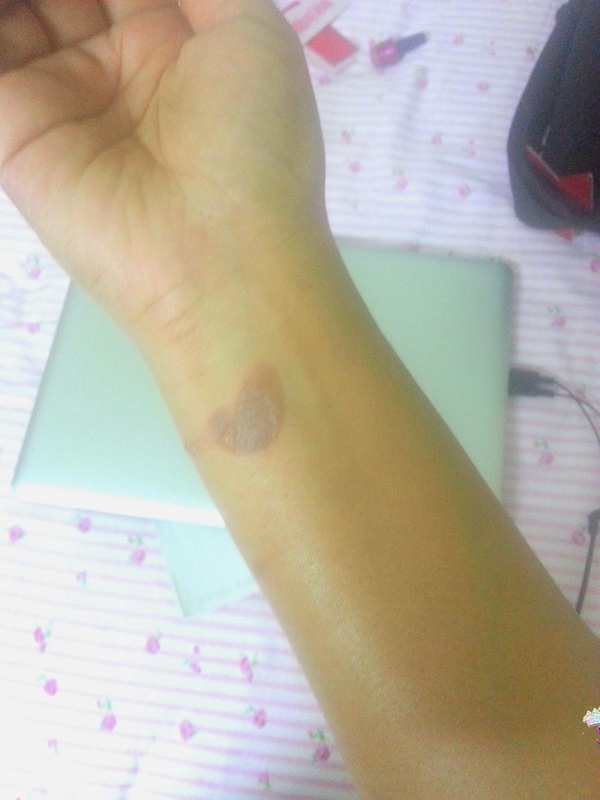 I was making breakfast Indian Aaloo kachori and while I got distracted by baby crying I put the kachori In Hot Oil in hurry and the Hot Oil just jumped out of the Frying Pan on my wrist ! Once I touched the hot iron by mistake . Once In the Bangalore India Beauty Parlor the girl burned My Skin with Hot Wax. 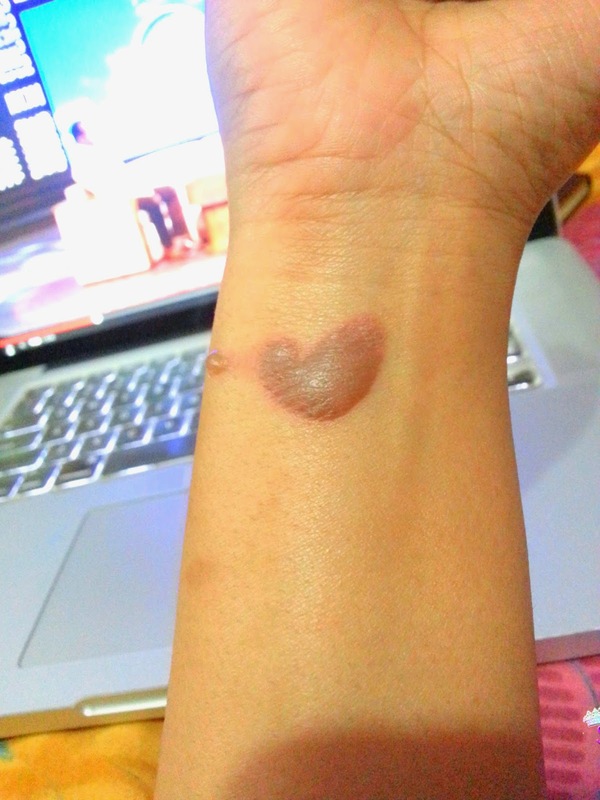 Another time I touched the Hot Pressure Cooker few months ago!! All those marks are still there on hand but they faded gradually by treating them with natural remedies, I used regular applications of coconut oil, 100% pure virgin coconut oil to fade the marks, and It works wonders with time.I also used tender coconut water to fade burn skin marks. 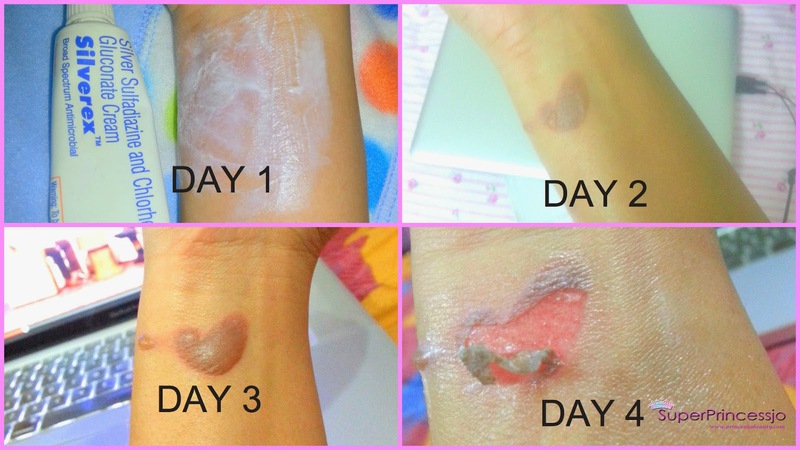 Day 1 So This is how the Burn looked immediately after accident , I applied Silverex cream (which I borrowed from my Indian Orissa neighbors ) immediately as I couldn't find my antiseptics in panic!! Day 2 Next morning when I woke up the mark was much darker and I could see the thick black/purple skin I now knew How much skin I actually need to regrow , Burned area was slightly painful and it had burning sensation it was a bit itchy too so I applied whole day the antimicrobial Silverex and coconut oil as well. I even tried the Colgate paste as it was burning a lot and Colgate paste gives the cooling effect . Day 3 Burn had become a blister and by this evening the blister was much bigger than you see in the pic below.It was filled with water and I was so conscious and careful that I may hurt it / pop it because my baby always wants to be carried or at least be around me and I was so worried that accidentally I will pop it , I even took bath very late in the evening that day very carefully so that I don't harm it. I was about to click pic but before that I had to carry my baby as he needed feed and than while transferring him from my arm to my husbands arm this Thing Popped off completely.. I applied the antimicrobial cream it started burning so bad.. So I washed it with running tap water it was a bit of relief but than I had to apply some medication to avoid the infection that may occur so I applied Boroline the antiseptic cream. I had tetanus injection last year in India before my delivery so I am not worrying about that for now. 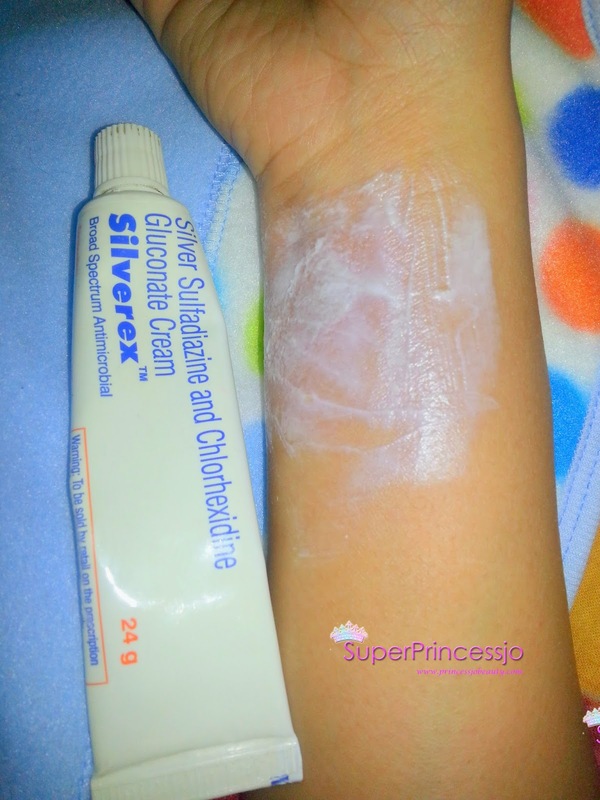 I also applied coconut oil again as this burn skin needs regular application sadly its on my wrist on right hand so it gets wiped when I do something or carry my 10 Months baby boy in my arms . So I need to reapply regularly the treatments of burn. Currently I have covered it with a Band aid as the skin from the burn blister keeps getting hurt or wiped while I carry baby or do other household stuff. Hey princess its so sad to listen wht u r going through becoz of this burn. I 2 had same incidence but it was boiling hot water with I was trying yo pour in bucket for bath n my hubby called me frm behind and it all splashed on my legs.I was screaming in pain n my mother in law brought me cinth oil u can check this online it works wonder.Now I don't hv any burn marks. Do you have any idea as to where we can get cinth oil in Bangalore? Because i can't find it in Bangalore. @preethi... :( I shall now do something about it thanks.. I have got some mates who love to read good posts and they sent me the link to this post and told me to read it and so, I did. And, although I am not a very big posts reader, I can say that this post that I read is one of the best writing projects that I have read or seen in my whole life. Just amazing stuff. Its a great pleasure reading your post.Antipodes Skin Care Antipodes Australia Its full of information I am looking for and I love to post a comment that "The content of your post is awesome" Great work. In the present day and age, there are a ton of skin mind medicines accessible to keep your skin sparkling and brilliant dependably! Thermage Treatment Costa Rica To follow are some great skin care tips to keep you looking fresh and lovely, no matter what your age is. However, shockingly,angelina jolie face cream that is all a large portion of them care about as they make ineffectively planned items that are simply intended to "look" viable.